The Camp Fire in Butte County was the deadliest and most destructive fire in California history. Adding to the considerable misery are the cats, dogs and other pets badly burned in the blaze. A veterinary center in Chico, just east of the fire, has treated more than 500 injured animals, the vast majority of them cats. Twelve of the animals -- six dogs and six cats -- have undergone a relatively new treatment of applying sterilized tilapia skins to their wounds. The fish skin contains collagen, a protein that can help prevent infection and restore burned skin. Dr. Jamie Peyton, of the UC Davis Veterinary Medical Teaching Hospital, volunteered to treat the animals. She used the technique last year on two black bears and a 5-month old mountain lion found in the Los Padres National Forest after the Thomas Fire. Tilapia skins are just one of the alternative treatments Peyton has used on animals; the others include acupuncture and chiropractic adjustments. She said today she was trying to "push the boundaries of veterinary burn care," and she has also used tilapia skin to treat wounds on owls, pigs and horses. The idea of using tilapia skins to treat burns first arose in Brazil. “We got a great surprise when we saw that the amount of collagen proteins, types 1 and 3, which are very important for scarring, exist in large quantities in tilapia skin, even more than in human skin and other skins,” Edmar Maciel, a plastic surgeon and burn specialist, told STAT last year. Peyton says a big advantage of tilapia skin is that it can be changed as infrequently as every two weeks; usually, new bandages have to be applied daily, which is painful for animals and is much more labor-intensive. "If you think about treating a hundred cats and doing a hundred cat and dog bandage changes every day, it's a lot of manpower," Peyton said. 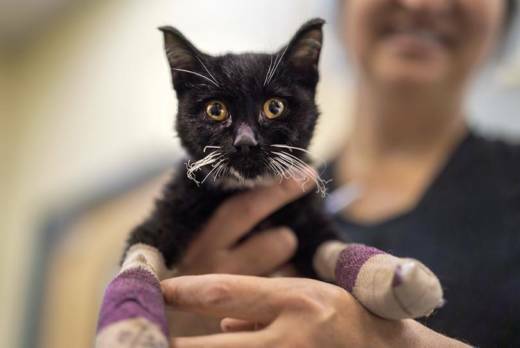 Among the animals treated in Chico was a 4-month old kitten with third-degree paw burns and the pads of his feet burned off. Peyton also treated an 8-year-old Boston terrier mix named Olivia, who showed up at the press conference today. She was found with multiple second-degree burns on her side and legs. 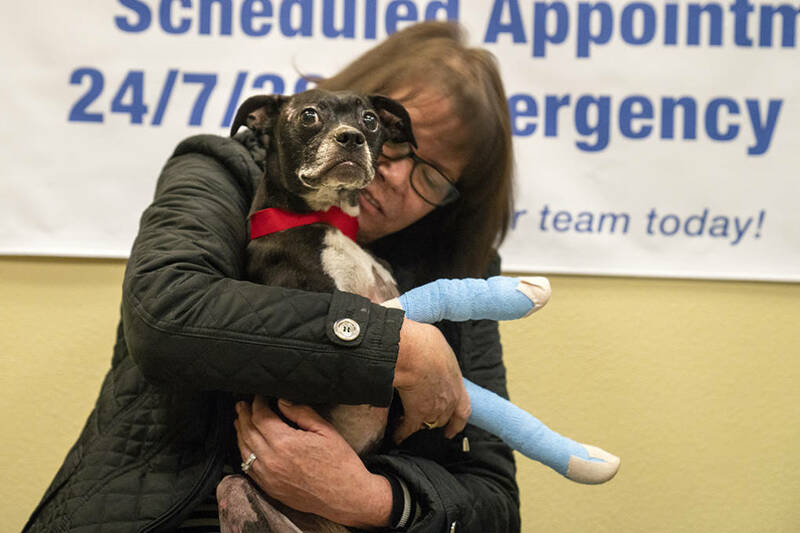 Her owners, Curtis and Mindy Stark, were out of town when the Camp Fire started and thought their dog had perished when their home burned down. Fortunately, Olivia had been chipped and was reunited with her owners. VCA Valley Oak veterinarians cleaned Olivia’s wounds, and she was given traditional pain medications. The Starks also agreed to have Olivia treated with tilapia skins...New skin grew on Olivia’s leg burn within five days. Normally, it can take weeks for skin to grow over severe burns. Mindy Stark, a former resident of Paradise, a town of 27,000 nearly erased by the fire, said that Olivia, sporting big sutures, gauze and wrapped legs, "started off kind of like a mummy" before the tilapia treatment. Curtis Stark said the treatment has helped considerably. He said Olivia likes the taste of the fish, which also helps. When Peyton and colleagues treated the bears and mountain lion last year, they stitched the tilapia skins to their burned paws, which were then wrapped in bandages of rice paper and corn husks; the fish skin eventually falls off when the wound is fully healed. But Peyton doesn't always use that method on cats, she says, because anesthetizing them can be risky. Instead, she wraps a small strip of tilapia skin on their paws with a bandage. Peyton calls the wrappings “little fish mittens." In addition to the cats and dogs, Peyton's team is treating a bobcat. Associated Press contributed to this post.